In comparison to other economic sectors, there are few regulations tackling shipping and port industry emissions. In developed nations, air quality has improved substantially during the last several decades, despite increases in population, traffic, and economic output. An exception is emissions from ships. Consequently, in European countries, it is estimated that the shipping emissions of Sox and Nox will exceed the emissions of these pollutants from all other sources by 2020. Hopefully, the International Maritime Organization, under the Annex 6 of the Marpol regulation is obliging ship owners to progressively reduce their NOx, SOx and PM (nitrogen oxide, sulphur oxide, particulate matter) emissions in order to reach acceptable targets by 2020. But the GHG emissions from ships are still not included in the countries emissions ceiling and there is no regulation obliging ports to monitor and reduce their emissions. It is important to note that reducing a ship’s emissions when it is sailing is good, but it is much better to reduce pollution while at berth, because it is particularly in those places that their fumes can cause health issues in communities. The health costs of emissions from international shipping for the European member states has been estimated by the Centre for Energy at 58B€ per year. The reason is that currently, sizeable European ports, continually welcome hundreds of ships, and are in very close proximity to urban areas, where the largest numbers of citizens live. The only way to reduce the emissions of those ships at berth and then cut the associated health costs is to plug vessels into the national grid, and thereby enabling them to switch off their engines. The issue is that the investment in shore connection systems is mostly borne by port authorities, whereas pollution-related health costs are, indirectly shouldered by governments. Mandatory regulation and an appropriate funding program are therefore absolutely required to internalize these costs and push ports to invest, because normal market forces will not play their role. There is a second, incentive-related barrier to overcome in order to ensure more shore connection systems are deployed and port emissions are reduced. Because the technology is relatively new within the merchant shipping industry, there are currently not enough ports equipped to motivate ships to get retrofitted, but neither are there enough ships retrofitted to convince ports to invest in a shore power system. The only way to break this chicken and egg conundrum is to set legal obligations for the provision of this technology. Some critics argue that because the benefits are not always proportional to the investment, shore power technology is not a “one-size-fits-all” solution and that national or regional- wide regulation mandating its installation makes no sense. Let’s consider the European Union example. From an environmental perspective, whatever the ship, whatever the port, shore side electricity enables all the ships at berth to switch off their engines and produce zero emissions. But indeed, the total emissions reductions are based on the local electricity mix. The study below demonstrates that the European electricity mix is much greener than ships engines, even those running with low sulphur fuel. From a commercial perspective, there are three European countries (Italy, Cyprus, Malta) where the price of electricity is currently more expensive than the price of fuel. But considering the rising fuel price trend and the increasing adoption of even more low sulphur type fuels, it is likely that in the coming years shore side electricity will provide ship owners financial benefits within all European countries. Consequently, considering both environment and financial analysis, at a European level at least, a binding regulation on shore power would make sense. There is already a successful example of strict regulation regarding this technology. Starting January of this year, vessels berthing in Californian ports must be equipped with a shore system, and ports are investing extensively to meet the state’s 2020 binding target of having at least 80% of ship power supplied by shore side electricity. This factual example is the proof that implementing a binding regulation is possible and practical. Such a decision should not hinge on the conclusion of a technology benefits assessment. The environmental benefits are clear; the technology is proven and globally standardized (see IEC/ISO/IEEE 80005-1 Standard). It is now a matter of appropriate funding and mainly, political willingness. 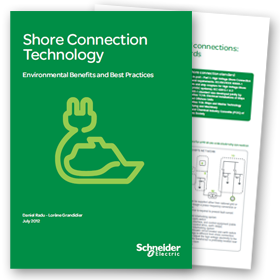 > To Know more about Shore Connection Technology, download our white papers for Free!